Students and host families and friends participating in the Internation Exchange program in St. Lawrence County. From left, front, are Carlos Bravo (Mexico), Stefan Vogel (Germany), Jared Carey of Potsdam; Juneth Christiensan, Amy Jo and Jim Warrington, all of Heuvelton; June Drake and Mark Curran, both of Massena; Beariz Nunes, Mary Latray of Canton, Quinn Lewis, Jacenta Fregoe of Massena; kneeling and standing in the second row are, from left, Jessica Trejo (Mexico), Valentina De Leon (Mexico), Giovanni Pagnossin (Brazil), Axelle Langle (France), Denise Grazow (Germany), May Phuong (Vietnam), Michael Klotz (Germany); and in the third row, from left, are Miguel Gomez (Spain), Maddy and Lilly Fregoe, Alvaro Acebo (Spain), Cris Delgado (Spain), and Michelle Fonesca (Ecuador). 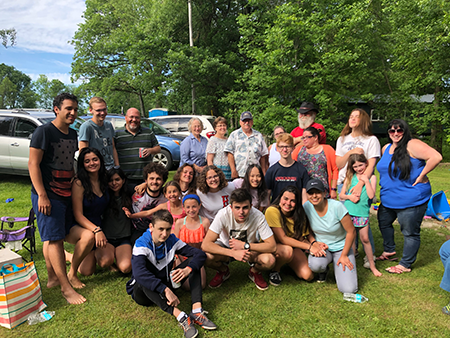 Local host families, friends and their exchange student guests from across St. Lawrence County gathered for a picnic to celebrate the year. St. Lawrence County host families welcomed 20 students from other countries into their homes this year. International Student Exchange is a nonprofit organization dedicated to bridging cultures and connecting communities by placing high school from around the world into welcoming volunteer host families, said a press release from the organization. The program enrolls 15- to 18-year-old students who travel from their home countries like Brazil, Italy, Germany, Mexico and Thailand, to be placed with host families across the United States. There is generally an average of 3,000 students with about 40 being placed in New York each year, the press release said. Students in the program also work on community service projects in their host communities, the organization said. This year 33 students logged a combined effort of 1100 community service hours. In St. Lawrence County exchange students have volunteered at fire departments, local charities such as Lights on the River, Operation ShoeBox, Polar Plunge, food and clothing drives, churches and senior centers, ISE said. To learn more about the program, visit https://www.iseusa.org/ or call 315-262-6308.